After finally finding that perfect NYC apartment, it’s time to prove you can actually pay for it. Many NYC newbies and even natives can’t meet landlords’ strict criteria, like having a high credit score or a salary that equals 40-45 times the monthly rent, for example. Which is where guarantors come in–a co-signer who guarantees payment on the lease if it otherwise can’t be made. But this is an entirely additional process, from finding someone who fits the bill to gathering all the paperwork. To make the process a simpler, 6sqft has put together a guide of everything you need to know about using guarantor and some tricks of the trade. How do you know if you need a guarantor? To know whether or not you need a guarantor, first understand what the landlord requires for tenants. If you do not meet their specific requirements, like if you don’t make enough money or have a bad credit score, a guarantor’s signature may be accepted. This makes them liable if you’re unable to make rent. Most landlords require renters to make 40-45 times the amount of monthly rent. For example, if you’re looking to rent a studio for $1,500 per month, expect to be required to earn about $60,000 to $75,000 annually. A good credit score may also be needed, which should be at least 700 out of 850. Find your credit score for free from places like annualcreditreport.com. Who usually signs a lease as a guarantor? Unfortunately, asking someone to be your guarantor is never easy. Usually, guarantors are family members or friends who feel comfortable enough signing a contract for you. If you plan on having roommates, it’s important to ask your landlord whether more than one guarantor will be accepted. 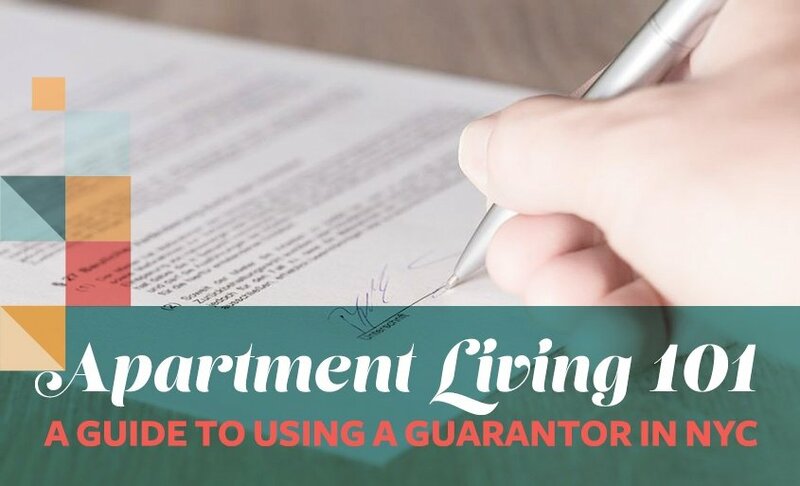 If multiple guarantors are accepted, it’s a good idea to draw up a contract among the guarantors to determine the protocol if one of the roommates misses rent. If just one guarantor is accepted, they must be comfortable becoming financially liable for you and all of your roommates. What requirements does a guarantor need to meet to qualify? For New York city apartments, landlords usually only accept guarantors that live in the city or the surrounding Tri-state area so they can sign an original copy of the lease. If this isn’t the case, like for many students, low-income individuals or international workers, you may need to use an institutional guarantor. Institutional guarantors are financial institutions willing to accept the financial liability of the rental contract in exchange for a fee. Usually, these institutions require lower incomes and credit scores to act as your guarantor. While requirements may differ depending on the building, guarantors are required to earn 80 to 100 percent times more than the monthly apartment for which you’re applying. Documents required to be submitted by your guarantor include the same that renters submit: two pay stubs, two bank statements, tax returns and a letter of employment. If they are self-employed or own a business, a certified public accountant may provide a statement regarding their income. Once guarantors sign on, they become responsible for any missed rent, and the landlord doesn’t always have to tell them immediately if they stop receiving monthly checks. How do I ask someone to be my guarantor? Besides getting down on your hands and knees to beg, there are other ways to ask friends or relatives for their financial help. Explain how competitive the market is and that since most landlords have a large pool of applicants to choose from they employ extremely strict requirements. You can also offer to draw up a separate contract with the guarantor that says you’ll repay them in the off chance that you miss rent. What if the person I ask to be my guarantor says no? If the family member or friend denies your humble request, there are other ways to get that dream NYC abode. Offering to pay multiple months of rent up front and all at once may be enough proof for your landlord to accept your application. Or, if the landlord remains inflexible, try looking for a different place with less strict requirements. If paying multiple months of rent up front seems like too much of a financial stretch for you, try looking for apartments that you can sublet, which lets you rent without putting your name on the lease. Finally, as 6sqft reported last year, a new start-up called TheGuarantors, will literally act as your cosigner. Perfect for students or international workers, the platform partners with the Hanover Insurance Group to work with tenants who earn as little as 27 times the monthly rent and have a credit score as low as 630. The service costs anywhere between five and ten percent of the annual rent. Another similar service, Insurent, provides renters an institutional guarantor that lets you meet the landlord’s requirements easily. The fee for this service will be approximately 80 to 90 percent of a month’s rent, although specific fees differ depending on your credit and financial condition. The fee is per lease, not per person.